Summertime Savings in Downtown Tampa! Hey everyone! Travis here with some tips on how to save this summer in downtown Tampa! The tip - make sure you get one of your FREE Summertime Savings Cards so you can save at 61 of downtown&apos;s best venues...and it starts today! Summertime Savings Cards are valid from July 1, 2009 through September 7, 2009 - Labor Day! 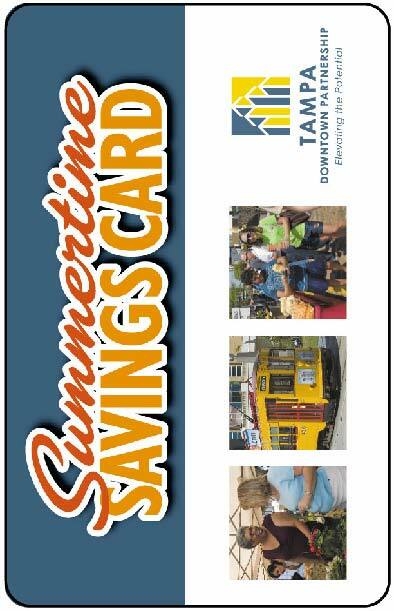 The Summertime Savings Card is FREE and available at numerous locations throughout downtown. To find a place where you can pick up a brochure containing a card, click here. Once you get your brochure listing the discounts available at the 61 venues and the card, get out there and enjoy all that downtown Tampa has to offer this summer! Where and what are these big savings you ask, well, click here to see a PDF copy of the brochure. Now, how&apos;s that for some savings on some great Tampa Bay entertainment...and, it&apos;ll give you some tips on where to eat, what to do and so much more! And, keep checking back for more great things to do in Tampa Bay!